Restore critical rainforest habitat for the Endangered Southern Cassowary. Every $10 will plant and maintain one rainforest tree for two years. This item is tax deductible. Every $10 will enable Rainforest Rescue to plant and maintain one rainforest tree for two years, providing habitat and food for the endangered southern cassowary. The cost per tree is based on the cost of propagation, planting and maintenance. The Endangered Southern Cassowary (Casuarius casuarius johnsonii) is one of the world’s most prehistoric birds, and the third largest. It is found only in the dense tropical rainforests of Far North Queensland Australia.The cassowary is known as a ‘keystone’ species, because of the role it plays as a major seed disperser for up to 238 different fruit species. 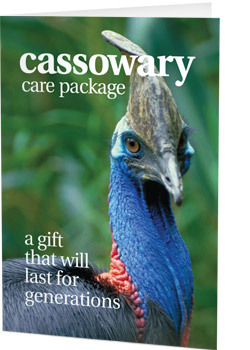 More than 80% of cassowary habitat in the coastal lowland rainforests of North Qld has been cleared. Rainforest Rescue is working to protect and restore what little cassowary habitat remains through the purchase of high conservation value rainforest and the revegetation of cleared areas of rainforest. <giver’s name> has bought you a gift of 100 rainforest trees which will provide food and habitat for the endangered southern cassowary. We provide free postage and handling for regular delivery; however for overseas and express post orders, an $8 charge will automatically be added at the checkout.